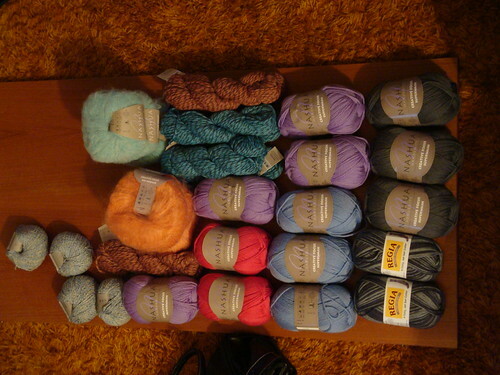 The two with the yellow label (lower right hand corner) is sock yarn. The light purple, dark gray, light blue and bright fushia yarn is really yummy merino-wool blend… worsted weight, one of my favourites. The ones that are twisted (that will need to be turned into balls) are wool-alpaca. The colours are amazing in person. The little small ones are a mixture of silk, vicose, linen and nylon. The orange-looking ring shaped ones are kid mohair and wool. The blue ring shaped ones are alpaca. It was a lot of fun at the store. As you might be able to tell, as evidenced by my sudden stash enhancement. Yarn is a horrible addiction. Honestly. To be fair, buying enough yarn to keep me occupied for hours and hours and hours is a lot cheaper than the amount of money I’d need to keep me occupied for hours and hours and hours with beads. Tomorrow’s going to be full of Christmas baking, which I’m looking forward to. I’m hoping to send at least 3 dozen cookies with my mom to work for her current coworkers/my former coworkers for Christmas Eve. And then I’m thinking at least a few dozen for my own family, since we’re seeing some extended family on Christmas Day, so that deserves cookies as well. Yay, baking. Can’t wait, my house is going to smell awesome!